DISCUSSION OF ”PETROGRAPHY AND GEOCHEMISTRY OF GRANITOID PEBBLES FROM THE OLIGOCENE-MIOCENE DEPOSITS OF THE INTERNAL RIFIAN CHAIN (MOROCCO): A POSSIBLE NEW HYPOTHESIS OF PROVENANCE AND PALEOGEOGRAPHICAL IMPLICATIONS” BY L.G. GIGLIUTO et al. REPLY TO THE DISCUSSION OF ”PETROGRAPHY AND GEOCHEMISTRY OF GRANITOID PEBBLES FROM THE OLIGOCENE-MIOCENE DEPOSITS OF THE INTERNAL RIFIAN CHAIN (MOROCCO): A POSSIBLE NEW HYPOTHESIS OF PROVENANCE AND PALEOGEOGRAPHICAL IMPLICATIONS” BY G. CARERI et al. Abstract: Numerous sedimentary basins including the Trofaiach Basin were formed along wrench corridors during the Miocene lateral extrusion of the Eastern Alps. Because of its rhomboidal outline, a pull-apart mechanism was proposed for the Trofaiach Basin already in the 1980s. However, the internal basin architecture is still widely unknown. To get a better insight into basin formation during continental extrusion, the Trofaiach Basin was studied integrating different geophysical techniques (gravity, seismics, magnetics), digital elevation models, microtectonic and maturity data. Basin formation is related to the E–W trending Trofaiach strike slip fault, which enters the basin at its eastern tip. The northern basin margin is controlled by a terminating branch of this fault, while the main movement was transferred through the basin along subvertical faults in the central basin and along its southern rim. (Oblique) normal faults define the western basin margin. The basin depth reaches a maximum of 800 to 900 m. A fluvial and shallow lacustrine environment was interpreted from seismic facies and borehole data. Clinoform geometries and petrographic evidence indicate sediment supply mainly from the South. Localized coal seams developed in different stratigraphic positions. Water depth probably did not exceed 50 m. Deep lacustrine environments resulting from high subsidence rates are characteristic for many pull-apart basins, but were not established in the Trofaiach Basin. Several erosional events are part of the evolution of the basin. An early erosional phase followed southward tilting of the oldest basin fill and uplift of basement rocks north-west of the basin. A second event caused a major erosional unconformity in the central basin. Finally, related to post-Middle Badenian compression, more than 1 km of strata have been eroded. Abstract: Lithostratigraphic, sedimentological and petrographic data collected from the lower portion (Eocene–Oligocene) of the ”Moldoviţa Lithofacies” (near the stratigraphic boundary with the underlying successions of the Tazlău ”Lithofacies”) show evidence of a turbidite system characterized by two different sedimentary supplies. Quartzarenite and litharenite sandstones, in fact, characterize the analysed stratigraphic succession, measured along the Ovăzu River, near the Ciumârna village (Bucovina region), thus testifying to the existence of two different provenances, linked to sediment sources tentatively identified with external cratonic areas and with inner crystalline belts together with their sedimentary cover, respectively. Moreover, the depositional trend, inferred by the facies analysis, shows an arenaceous interval interpreted as part of an active system (lobe or channel) included in thin and fine-grained facies probably belonging to fringe or marginal areas. Fine-grained lithofacies with menilite beds, typical of basin plain, are well represented in the upper part of the succession. Similar turbiditic deposits, but Oligocene–Miocene aged, are well known along the Betic-Maghrebian Chain (”Mixed Successions” auctorum), where they represent the stratigraphic interference of two opposite depositional systems closely linked to the starting of the tectogenesis preluding the closure of the Maghrebian Flysch Basin. Nevertheless, the analysed succession, very similar in composition and in textural characters to the Betic-Maghrebian ”Mixed Successions”, cannot assume the same significance. In this case, in fact, we suppose that the studied succession could be linked to a peculiar paleogeographical morphology of the sedimentary basin, excluding that tectonic events could have been the main control factors of the interaction of the two recognized different depositional systems, owing to the Eocene–Oligocene age of the lower portion of the ”Moldoviţa Lithofacies”, here analysed. Abstract: The 5.5 m thick Dynow Marlstone in well Oberschauersberg 1 in the Upper Austrian Molasse Basin was studied using mineral and maceral petrography, SEM, organic geochemistry, and C- and N-isotopy of the organic material. The well is located on the former upper slope of the northern basin margin. The depositional period of the Dynow Marlstone covers parts of the Early Oligocene nannoplankton Zone NP23, which corresponds to the culmination of the first Paratethys isolation. The Dynow Marlstone represents a carbonate-rich, organic-poor interval (0.5–2 % TOC) intercalated between organic-rich formations. The onset of the deposition of the Dynow Marlstone was characterized by an abrupt increase in primary carbonate productivity, but persisting photic zone anoxia. Both high organic carbon productivity and photic zone anoxia prevailed during deposition of the Dynow Marlstone. These constant conditions were overprinted by cyclic increases in the trophic level favouring blooms of calcareous nannoplankton. Limestones with low TOC contents were deposited during algal blooms, whereas organic-rich marls accumulated during periods with low production of calcareous nannoplankton. Sulphate reduction extended into the water column. The intensive consumption of labile organic material decreased the hydrogen index. Intensified photic zone anoxia and an increase in salinity worsened the ecological environment for calcareous nannoplankton and led to deposition of the organic-rich marls of the Eggerding Formation within a constantly eutrophic and normal-marine environment. 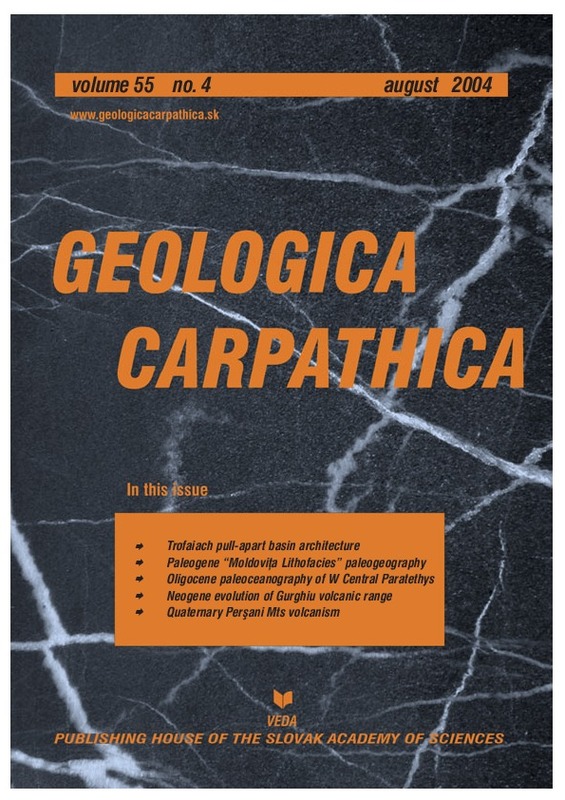 Abstract: K-Ar ages of rocks from the Gurghiu Mountains, the middle part of the longest volcanic chain in the Eastern Carpathians (Călimani–Gurghiu–Harghita), indicate an interval of volcanic activity between 9.4–5.4 Ma. Magmatic activity migrated from North to South and built the following volcanic centres: Jirca (J), Fâncel-Lăpusna (FL), Bacta (B), Seaca-Tătarca (ST), Borzont (BZ), Sumuleu (S) and Ciumani-Fierăstraie (CF). The timing of volcanic activity in each volcanic centre reflects the previously recognized overlapping age progression from North to South along the arc: J=9.2–7.0 Ma; FL=9.4–6.0 Ma; B=7.5–7.0 Ma; ST=7.3–5.4 Ma; BZ=6.8 Ma; S=6.8–6.2 Ma; CF=7.1–6.3 Ma. Two peripheral small intrusive bodies have also been dated (Ditrău — 7.9 Ma and Corund — 7.4 Ma). The duration of volcanic activity of each centre is ca. 1 Ma, with a larger interval of 2.5 Ma for the Fâncel-Lăpusna volcano. Volcanic activity in the southernmost volcanic centres (ST; BZ; S; CF) between 7–6 Ma was contemporaneous. Certain volcanological problems are pointed out: (i) the voluminous debris-avalanche deposit assumed to belong to the Călimani Mountains includes blocks of ca. 8 Ma up to the Gurghiu Valley and between 7.5–7.8 Ma south of the Gurghiu Valley (ii) the Fâncel-Lăpusna caldera was generated around 6.9 Ma and involved a post-caldera uplift and/or erosion of the caldera floor and younger domes; and (iii) the model based on volcanic facies distribution is consistent with the new age-data. Abstract: New K-Ar ages combined with paleomagnetic data demonstrate that the basaltic volcanism in the Persani Mountains occurred in two relatively short phases. The first one lasted several tens of thousands of years around 1.2 Ma and it seems that the inception of the volcanic activity took place in two isolated places and reached the maximum extent during the Cobb Mountain Normal Polarity Subchron when larger areas were covered. The second phase started just before 600 ka and was restricted to the central area of the volcanic field. One lava flow of this phase recorded a short-lived reversed polarity event inside the Brunhes Normal Chron, probably the 15b reversal excursion. The duration of this phase was less than 200 kyr, which is the best estimate according to the available radiometric data.